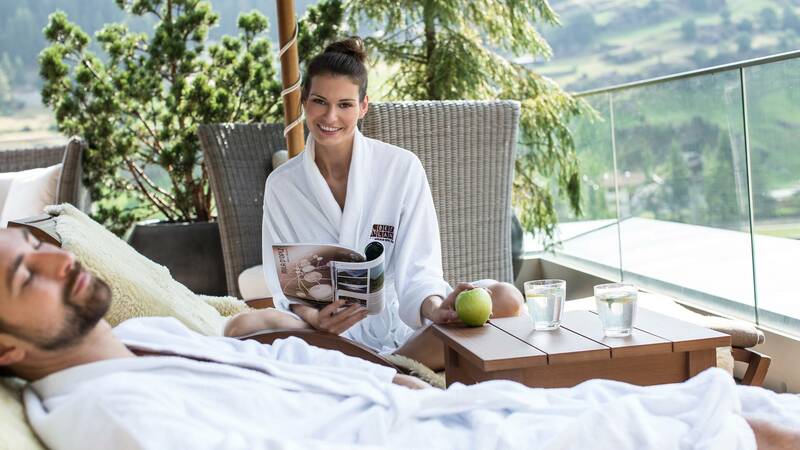 Leave everyday life far behind and get away from it all with a visit to the 1,700m² Sky Spa at the Hotel Bergland in Sölden. Our experienced team of beauty and massage experts will be happy to advise you on the best treatment for your needs. We use only the finest essential oils and natural herbs from our own herb garden. 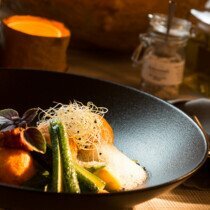 Treat yourself to a time out during your next holiday at the Hotel Bergland. 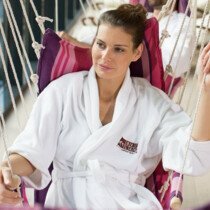 Book a treatment of your choice until 14:00 and enjoy ten extra minutes of relaxation at the Sky Spa. To avoid disappointment, we recommend that guests book an appointment at the Sky Spa before they arrive. Do something good for your body so that your soul wants to live in it. We happily take some time to help you find the right treatment method from our selection of active agents paired with instrument-based cosmetics. At the SKY SPA, every treatment is tailored to your individual needs according to a digital skin analysis. Through the well-balanced synergy of powerful, alpine plant extracts, natural ingredients and precious emulsions, your skin gets everything it needs to appear smooth, firm and energetic. Beautiful hands and feet? Need care! If you love your hands and feet, you should give them your best attention. Purify visibly and effectively: Problem areas are targeted in this treatment using the firming body wrap method. The specially developed Cello Gel with 35 essential oils literally heats up your fat cells, stimulates your connective tissue and has a firming effect on the skin. 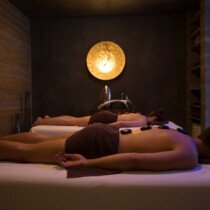 The SKY SPA Signature Massage reflects a holistic treatment concept that optimally meets your needs through the perfect symbiosis of different massage techniques. Do something good for your feet. The foot reflexology stimulates the blood flow, stimulates the body's self healing powers and releases tensions and blockages. Here at the Ötztal, we have thoroughly studied the old knowledge and reinterpreted it in our own way. We complete the traditional lava stones with the power of the Ötztal garnets and arnica oil, to fully activate and strengthen your body´s self-healing powers. The original from the "Wat Po" temple in Bangkok. Reduces stress and makes your body agile. When doing the acupressure the therapist uses a special technic to mobilise the pressure points in your body. As the perfect complement to the Nuad Thai massage especially for you, we recommend THAI YOGA from our free weekly program. Thai yoga involves active stretching, whereas traditional Thai massage involves passive strechting. We're happy to offer you Thai yoga or Pilates privae lessons outdoors or in our youga room. Stretching exercies for the whole body. Choose the body peeling you need. Gives a pleasant fresh feeling. Afterwards you can enjoy the signature massage, specifically tuned to your needs. Total luxury. 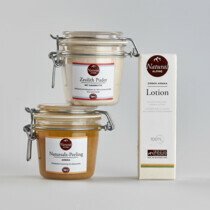 After the Treatment Purity peeling, why not treat yourself to a soothing body pack. After the treatment you will feel reborn! A soothing massage with a brush and subsequent moor pack. 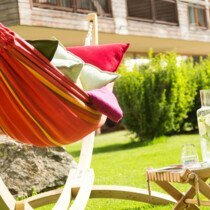 The mud & herb pack, combined with heat in the hammock chair, activates the metabolism, relaxes muscles and stimulates the blood flow. The benefit of signature massage with arnica pine milk intensifies the effect for the whole body. Nurturing and refreshing arnica crystal peeling frees the skin from excess sebum and leave the skin feeling soft and silky. "What we have loved and experienced as kids will remain a property of the heart up until old age"
The subtle natural energy offers the ideal support for the intense workout and regeneration sessions. Do you know that refreshing feeling of a walk after a summer storm? We owe this unique feeling to the purifying effect to the thousands of newly formed ions in the air. The ionic foot bath has a similar effect: Due to electrolysis, the saline water is ionized to a high degree and thus leads to natural detoxification and regeneration. We are happy to also welcome day guests at the Bergland SKY SPA on 1700 m² over the rooftops of Sölden! 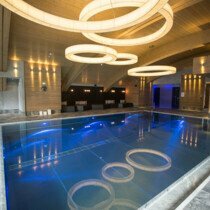 The entire sauna area with four saunas, outdoor whirlpool and indoor pool, two relaxation rooms, fitness and gym room, participation in the activity programme, bathrobe, towels and bath slippers is accessible for you. In order to make your day as comfortable as possible, we kindly ask you to book in advance. Get in touch with one of our friendly and highly skilled members of staff at the Sky Spa to book an appointment during your stay at the Hotel Bergland.